An excellent source of energy supporting normal physical and mental performance while helping achieve a soft, shiny, and healthy coat. 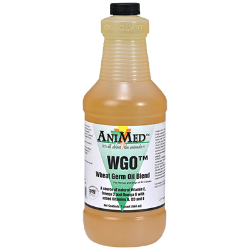 A blend of Wheat Germ and Soybean oils fortified with additional vitamin A, D3, and E.
WGO™ Blend should be top dressed or mixed with normal feed ration. As a general rule of good feeding practice, oils should be introduced gradually. Horses: 1000lbs total body weight, feed 2 to 4 ounces daily. Horses 500lbs total body weight, feed 1 to 2 ounces daily. Dogs over 50lb, feed 2 tsp daily. One teaspoon is approx. 1/6 ounce. Soybean Oil, Wheat Germ Oil, Retinyl propionate (Vitamin A), Cholecalciferol (Vitamin D), DL-alpha Tocopheryl Acetate (Vitamin E), BHT (preservative), Propylene Glycol.